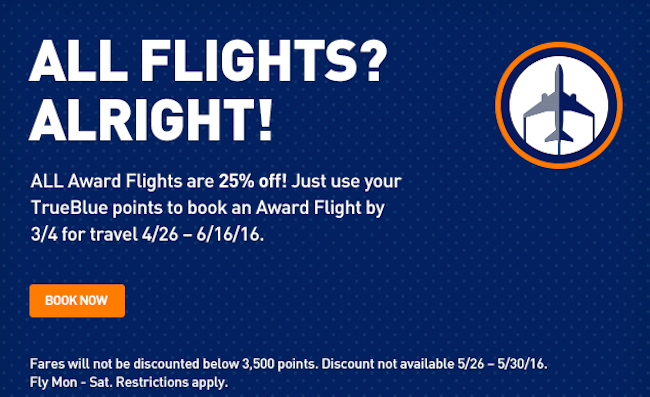 Redeem your TrueBlue points for an Award Flight by March 4 and save 25% when you travel between April 26 and June 16, 2016! Please note: When you search for an eligible Award Flight, the fare you see will automatically include the discount. Fares will not be discounted below 3,500 points. Remember, you can transfer your American Express Membership Reward points to JetBlue. You would need to transfer 8,000 Membership Reward points to convert to 6,400 JetBlue points. This is a great conversion as 8,000 Membership reward points would only cover $80 in flights (if used in their travel portal). In this case your 8,000 points transferred to JetBlue is earning you a free flight that would otherwise cost $129, great use!